John Charles Thomas, the first African American to sit on the Virginia Supreme Court, began his higher education at the University of Virginia in 1968, and four years later he graduated with a Bachelor of Arts degree in American in 1972. He was immediately accepted into the University of Virginia’s Law school and graduated with his law degree in 1975. Thomas’ first job was at the law firm Hunton, Williams, Gay & Gibson in Richmond, Virginia. He was the first African American to be employed at this firm. Thomas’ career quickly became a long succession of “firsts”. 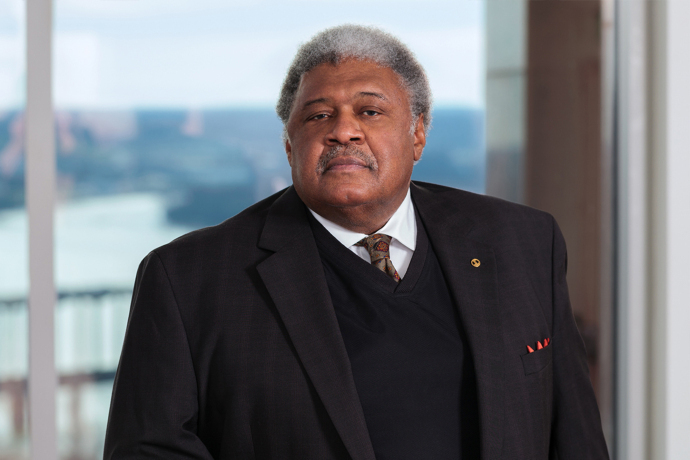 In 1982, he was the first black lawyer in the history of the American South to become partner in a major law firm. In 1983, he when he was appointed to the Supreme Court of Virginia by Governor Chuck Robb, he was the first African American to hold this post and at 32, the youngest person appointed of any race or ethnicity. After seven years of devout service to the state of Virginia, Williams retired due to illness. He returned to practicing law at his old, but newly named, law firm, Hunton & Williams LLP. In 1995 Thomas was given the NAACP’s Lifetime Image Award. After his Supreme Court years Thomas held a number of significant positions. In 2005 he was appointed to the International Court of Arbitration for Sports which is based in Lausanne, Switzerland. This court consists of leading attorneys and judges that hear cases that revolve around sports-related disputes involving drug violations and rules in international; sports federations. It also rules on cases arising from the world-class sporting competition and has global jurisdiction. While working for the Court of Arbitration for Sports, Thomas was appointed to the Board of Visitors at the College of William & Mary. He was reappointed to this position three years later in 2009. Thomas now works as the chief of appellate practice at Hunton & Williams and he has retired from both the College of William and Mary, and the Court of Arbitration for Sports. He is a trustee emeritus of the Thomas Jefferson Foundation, which owns and operates Jefferson’s home, Monticello and a Friend of the West Point Class of 1917. He is also a frequent lecturer around the world having presented in venues as wide-ranging at the Interim University Center in Dubrovnik, Croatia and the United States Military Academy at West Point, New York. He has given the commencement addresses at both the University of Virginia and the College of William & Mary. Thomas is the recipient of the Bailes Award from the Virginia Bar Association and in 2014, he was named distinguished Alumnus of the UVA College of Arts and Sciences. In addition to his legal accomplishments, Thomas recited his own works of published poetry at Carnegie Hall. John Charles Thomas married Pearl Walden. They have three children and two grandchildren. “John Charles Thomas, Partner.” Hunton & Williams LLP, https://www.hunton.com/en/people/john-charles-thomas.html; “John Charles Thomas,” University of Virginia School of Law School, https://content.law.virginia.edu/faculty/adjunct-profile/jct2ub/2708803; Erik Zagursky, “Former Virginia Supreme Court Justice John Charles Thomas to speak at Convocation,” William and Mary News, June 6, 2017, http://www.wm.edu/news/stories/2017/former-virginia-supreme-court-justice-john-charles-thomas-to-speak-at-convocation.php.